Applegarth Dental & Orthodontics is a practice dedicated to helping patients of all ages receive gentle, compassionate dental care. With the team of Dr. Thind and Dr. Puri at the helm, patients in East Windsor, New Jersey, have access to highly experienced professionals who understand the anxiety that may surround dental procedures. The dentists work with each patient to ensure their comfort, protect their dental health, and help them achieve smiles they’re proud to display. With Dr. Thind’s experience in general and cosmetic dentistry and Dr. Puri’s specialization in orthodontics, you can obtain the full scope of dental care at Applegarth Dental & Orthodontics. Whether you need a routine check-up, a filling, or a restoration, such as a crown or bridge, you’ll get customized attention and top-notch dental care. The team at Applegarth Dental & Orthodontics is available for dental emergencies. They also provide full and partial dentures and perform root canals, dental implants, and tooth extractions. When children and adults need orthodontic care, Dr. Puri offers diverse options, from traditional braces to the virtually invisible Invisalign®. You also have access to cosmetic dental services at Applegarth Dental & Orthodontics. Whether you want professional whitening, or would like veneers to eliminate discolorations or make uneven teeth appear straight, you’ll find the best solution for your dental needs. 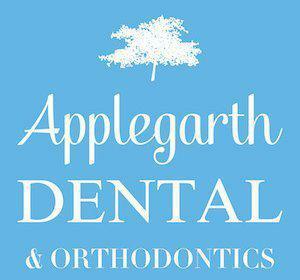 When you enter Applegarth Dental & Orthodontics, you’ll immediately notice the relaxed and welcoming atmosphere. They encourage you to talk about your dental concerns and anxieties, so they can take steps to help you overcome these issues and get in the habit of regular dental care. If you have questions or would like to schedule an appointment, call the office or use the convenient online booking.